Wowsa! 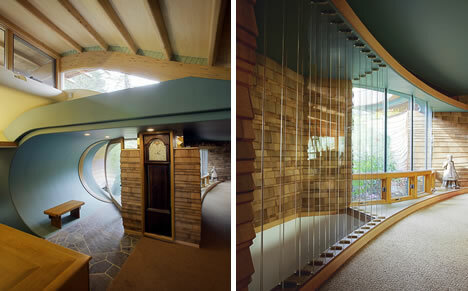 Architect, artist, magician, Robert Harvey Oshatz is all of that and so much more. 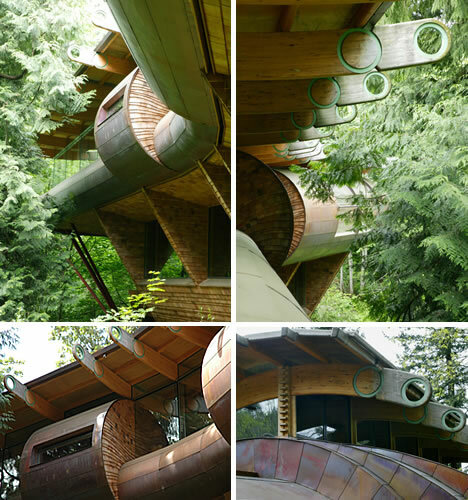 He is the organic architect responsible for this magnificent home up in the canopy; the coolest house in the trees that you will likely ever see. 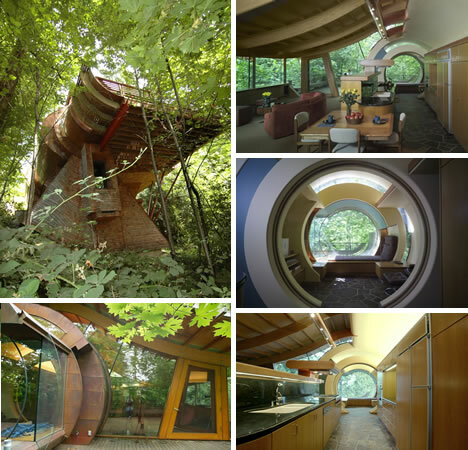 The unique Wilkinson Residence graces the wooded landscape outside of Portland, Oregon. 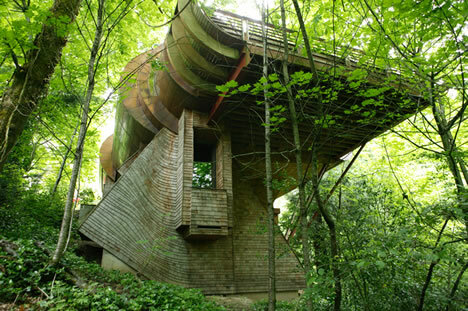 This treehouse would turn even the Swiss Family Robinson green with envy. More than likely you too will have a more than a twinge of desire to live in it. 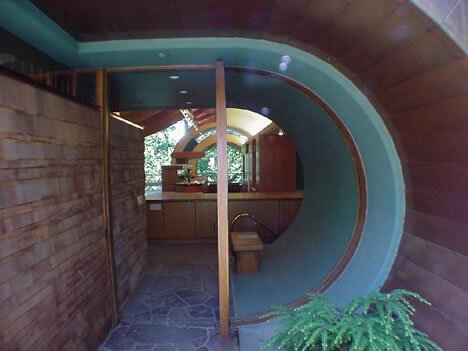 This home was referred to as the Wilkinson Wave House by HGTV Extreme Living. You can see the waves, circles and cylinders, mimicking nature and music. 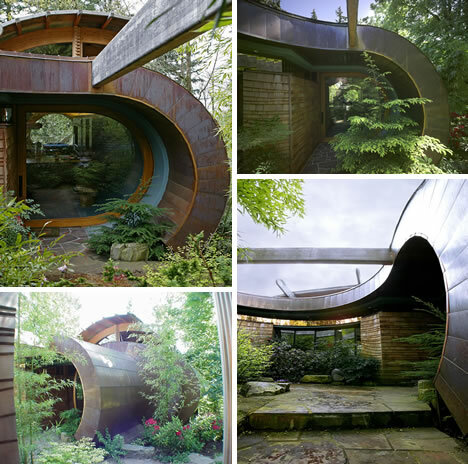 The copper clad roof runs around the courtyard and is turned down to define the entrance. To enter this home, a person walks down a steep driveway and through a small courtyard. The floor then continues out over the slope as the ground rapidly drops away. 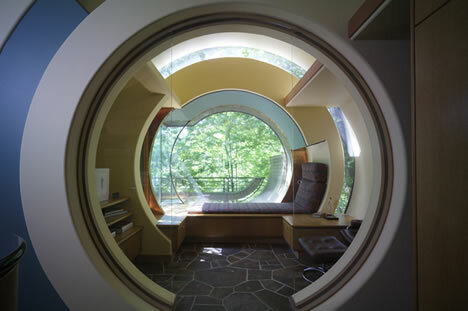 Oshatz gave his client what was asked of him, a house that felt as if it were isolated in the forest and that would allow him to hear the songs of birds. This home speaks to all of the senses. Being built on such a steep slope with the living spaces extended onto a deck, heightens the feeling of living in the forest canopy. 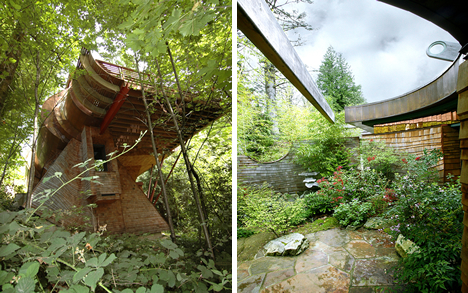 By the time a person reaches the cantilevered deck amongst the trees, the floor level is about 25 feet above the ground. 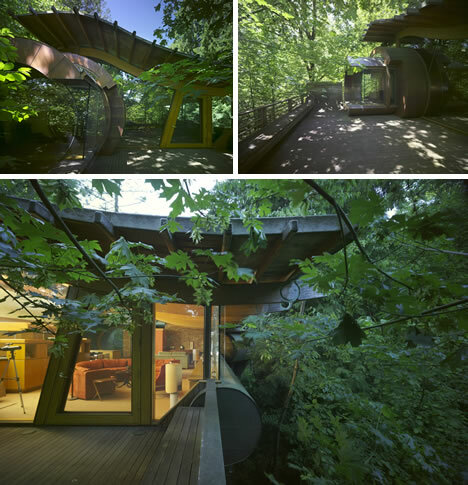 The upper floors extend out into the forest canopy while the lower floor is recessed into the structure. The house uses a combination of western red shingles and copper. 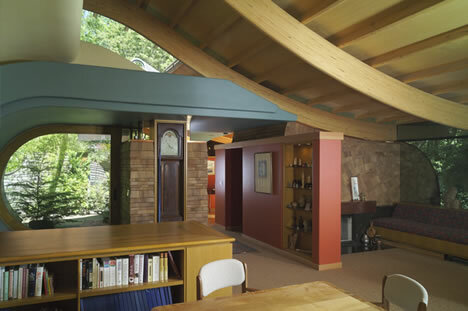 Douglas fir beams express structural elements within the gorgeous home. 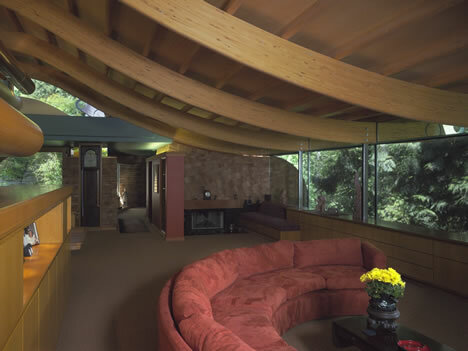 “One example is a natural wood ceiling, floating on curved laminated wood beams, passing through a generous glass wall which wraps around the main living room.” There is more than one answer to any problem and Oshatz emphasizes his outstanding vision and uniquely artistic and architectural talent with each of his creations. Step inside of the home to see the open plan arrangement. The upper floor of this breathtaking home is used for the more public functions. More private spaces like bedrooms and bathrooms are recessed downstairs, giving them a protective quality. 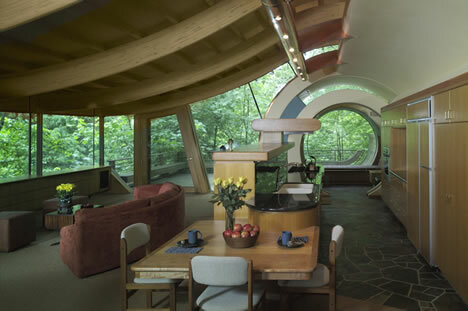 So much light comes in through the windows, allowing the home owners to feel like they live in the forest canopy. Yet the woods offers a cool shaded environment too instead of scorching heat through all that glass. 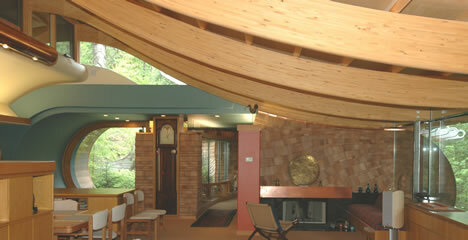 The wavy handcrafted cedar beams function acoustically with the surrounding materials to enhance the musical experience. 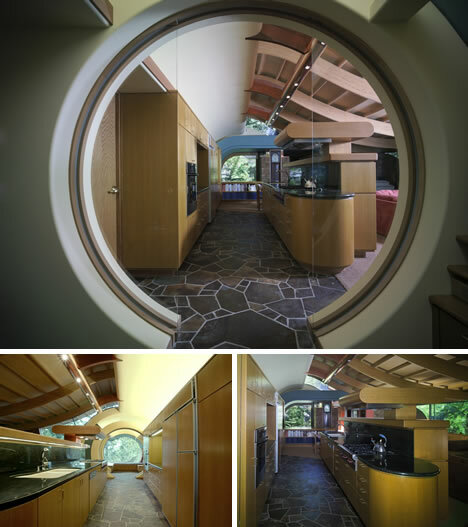 Surely the homeowner, an avid chamber music fan, had no idea that Oshatz was a magician as well as architect to make all his dreams concerning this dream house come true. These views are from kitchen area towards the entry and the fireplace alcove. 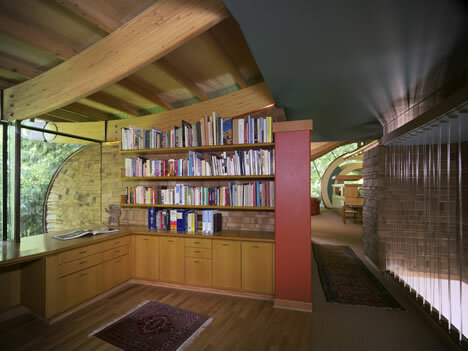 The study alcove is connected to the rest of the house, but also keeps up a distinct connection to the outdoors by way of windows to let let nature inside. There are also mirrors to lend that one-with-nature feeling. 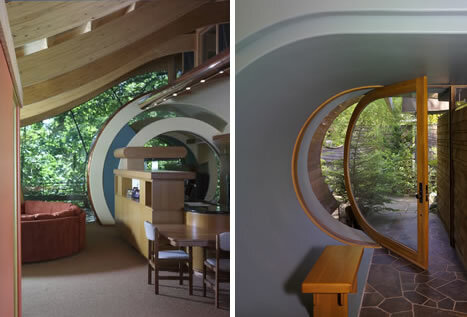 Another highlight of this home is the cylinder-shaped Round Reading Room. This custom-designed lounge off the kitchen was made using hand-cut templates and wooden ribs. 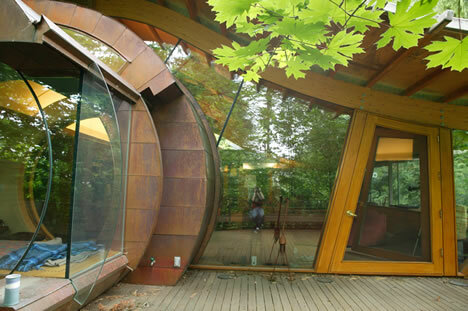 The meditation room extends out onto the deck to provide an enhanced connection with the great outdoors. Whether sitting at the fireplace alcove or the desk, one is in tune with nature. 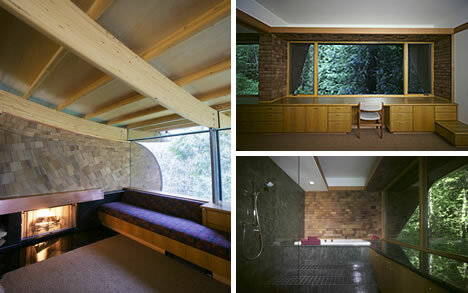 Even from the amazing shower, Robert Oshatz managed to connect the house with its stunning natural surroundings. This is a brilliant example of the harmony of bringing nature into the house and keeping the house beautifully blended with nature from the outside. Site Area: 2200 sq. mt. Built-up Area: 480 sq. mt. All images provided by Architect Robert Harvey Oshatz, a true gentlemen, gifted artist, and architectural magician who creates romantic work.